This was observed while hiking to and from Dewey Lake. The Wildlife Rescue Center was amazing and I’d do it again tomorrow!! The Wildlife Rescue Center was amazing and I’d do it again tomorrow!! It did take a lot of time to get there and some people were moaning but no one was complaining on the way back!! The tour was out of Haines. We took the ferry to Haines, rented a car and went to Kroschel Films Wildlife Center then drove up to see the gorgeous glaciers in British Columbia ... breathtaking! This was a highlight of the trip. This was a highlight of the trip. 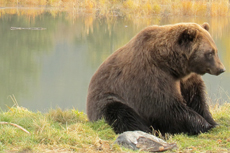 We saw bears and eagles and we were guided by a naturalist who was well-informed and helpful. This tour started with a ferry ride through a nice fjord. we looked and looked for bear but didn&apos;t see any. we looked and looked for bear but didn&apos;t see any. we were at the end of the season, unfortunately. But if you love Eagles, you&apos;ll love this tour. keep your camera handy. This was a fun tour with great opportunities for the wildlife photographer! We went by ferry from Skagway to Haines, where we boarded a bus for a wildlife tour. We went by ferry from Skagway to Haines, where we boarded a bus for a wildlife tour. During the tour we saw bears, eagles, seals, and lots of salmon. We really enjoyed it. I wish I could give the Kroschel Wildlife Center excursion 10 stars instead of just 5. Amazing trip on water to see eagles, moose and a brown bear. We were broken into groups of 6 so it was very intimate. Nice, quiet relaxing boat ride. Excursion SK03. A VERY STRENUOUS tour. Climb up the side of the mountain 350+ ft.through very narrow walkways and then down another 350+ft. Not recommended for seniors. First time in Haines. Good tour...rainforest hike was great. Saw mother bear and cubs from about two miles away. Awesome! Eagles galore. Beautiful views and vistas. We went to the Discovery-endorsed Kroeschel Wildlife refuge. Steve Kroshel&apos;s park was beyond amazingly cool. Steve Kroshel&apos;s park was beyond amazingly cool. Intense amount of animal interaction for guests! Whale watching in the evening. Whale watching in the evening. We spotted 9 humpback whales. It was very exciting. A boat ride to Haines and Davidson Glacier. We rode the water taxi (catamaran) down to Haines, which was an interesting experience in itself. Did the Glacier Point Wilderness Safari. Did the Glacier Point Wilderness Safari. Got to do a little of everything (boating, hiking, glacier watching, etc), which was nice. It was really nice to see the animals up close.